Former FBI Director James Comey is scheduled to testify before the Senate Intelligence Committee on Thursday. For a calendar of upcoming events, see: accuracy.org/calendar. Rowley, a retired FBI special agent and division legal counsel whose May 2002 memo to then-FBI Director Robert Mueller exposed some of the FBI’s pre-9/11 failures, was named one of TIME magazine’s “Persons of the Year” in 2002. She just wrote the piece “Russia-gate’s Mythical ‘Heroes’” for Consortium News, which states: “Mainstream commentators display amnesia when they describe former FBI Directors Robert Mueller and James Comey as stellar and credible law enforcement figures. Perhaps if they included J. Edgar Hoover, such fulsome praise could be put into proper perspective. 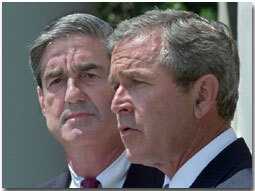 “Although these Hoover successors, now occupying center stage in the investigation of President Trump, have been hailed for their impeccable character by much of Official Washington, the truth is, as top law enforcement officials of the George W. Bush administration (Mueller as FBI Director and James Comey as Deputy Attorney General), both presided over post-9/11 cover-ups and secret abuses of the Constitution, enabled Bush-Cheney fabrications used to launch wrongful wars, and exhibited plain vanilla incompetence. “For his part, Deputy Attorney General James Comey, too, went along with the abuses of Bush and Cheney after 9/11 and signed off on a number of highly illegal programs including warrantless surveillance of Americans and torture of captives. Comey also defended the Bush administration’s three-year-long detention of an American citizen without charges or right to counsel. “What’s not well understood is that Comey’s and Mueller’s joint intervention to stop Bush’s men from forcing the sick Attorney General to sign the certification that night was a short-lived moment. A few days later, they all simply went back to the drawing board to draft new legal loopholes to continue the same (unconstitutional) surveillance of Americans.